Videos : Canadian University hockey game erupts into wild bench brawl! Canadian University hockey game erupts into wild bench brawl! I think it's safe to say that cooler heads definitely did not prevail in this incident. On Saturday night the Acadia Axemen faced off against the StFX X-Men in a match up in the Atlantic University Sports league in Canada and all the talk after the game has been focused on a wild incident that took place during the game. At roughly the halfway mark of the third period between these two teams all hell broke loose resulting in one of the craziest scenes on a hockey rink so far in 2019. 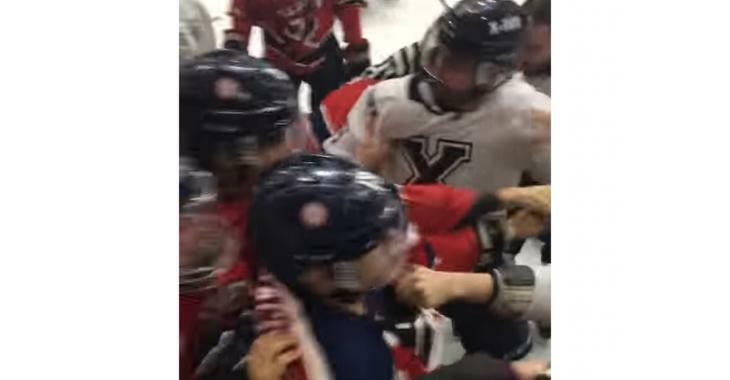 It's unclear what exactly sparked what can only be described a massive bench brawl between the two teams but we do know that Axemen captain Liam Maaskan had just scored prior to the brawl giving his team a 4 - 2 lead over the X-Men at the time. The brawl was absolutely insane with seemingly every one the ice and on the bench getting involved in one way or another. It was not just the players trading blows however as several coaches could be seen getting involved grabbing players and trying to diffuse a situation that looked like it wasn't ready to be diffused at all. All in all the brawl resulted in a massive 20 minute delay during the game and after all the dust had settled a whopping 310 penalty minutes had been dished out by the officials on the ice. To make matters worse however both of the respective head coaches for either team were ejected from the game following the incident, although why they were tossed remains unclear at this time. Sure you do have to exercise some control over your players as a head coach but given just how volatile this situation appeared to be I can hardly blame the coaches for not being able to wrangle a large group of physically gifted and very strong young men. In addition to both of the head coaches being ejected from the game the officials on the ice also tossed an additional five Acadia Axemen players out of the game and added eight more from the StFX X-Men as well. No word yet on whether or not any further discipline is expected at this time.